I am so happy to share Mara’s birth story with you – a story that didn’t unfold exactly as I expected (how could it? ), but ended up even better than I could have imagined. While my two childbirth experiences share a lot in common (both babies arrived two or three days shy of 37 weeks in labors that were five hours or less), I’m more struck by the differences between them. Corban’s birth story was somewhat dramatic. Mara’s definitely had its moments, but overall it was more like an episode of “Touched by an Angel” than “ER.” I think I prefer it that way! The story begins Saturday night, August 31. It was the day after our five-year wedding anniversary. We took advantage of the fact that Peter’s parents were in town and went out to the movies while they put Corban to bed. At my 36-week doctor’s appointment earlier that week, my doctor had told me the baby’s head was lower than the week before and asked if I could feel the pressure in my pelvis. The answer then was “no,” but as I munched on buttered popcorn and sipped Cherry Coke during “The World’s End,” I definitely noticed it. On the drive home I told Peter I didn’t know how I could handle being pregnant for another three weeks if that were in store. I was just so uncomfortable. We got home early enough to watch some “House Hunters” with Peter’s parents before retiring to bed. I had been bugging Peter to read a particular section of the Bradley Method book I was reading, so he finally read it while I perused another childbirth book and pointed out that I wanted to write down a birth plan in the next day or two. At 2:20 a.m., Corban woke us up with a piercing cry. Peter attended to him while I lay in bed and started noticing some pretty strong contractions. I had felt similar contractions over the past several weeks, and thought if I could fall back asleep they would stop. As I dozed in and out of a light sleep for the next hour, never really falling back into slumber, I realized they were consistent, and they weren’t going away. At that point, I told Peter what was happening. He tried to convince me I was just dehydrated from all the popcorn, and had me drink water and take some Tylenol. 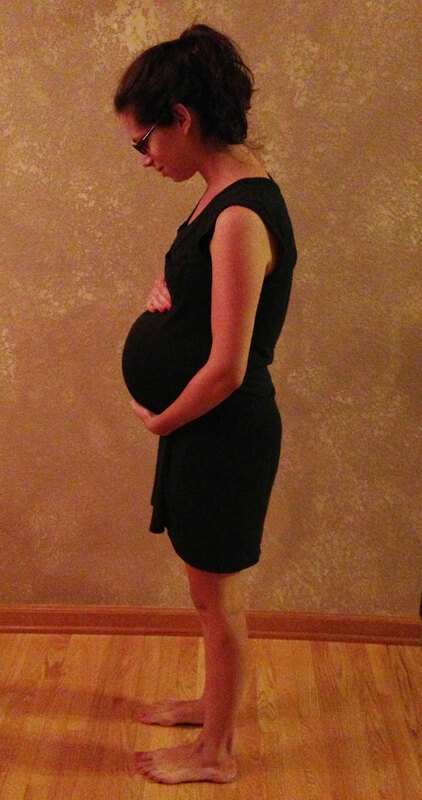 My doctor had said Tylenol “won’t touch” labor contractions, so if the pain didn’t go away I’d know it’s real labor. Peter also started Googling how to stop labor and suggested I drink a glass of wine. I did not indulge. Another hour went by. This entire time, I was focused on remaining relaxed and comfortable through each contraction. I lay on my side on our bed with a pillow between my knees and consciously released tension, muscle by muscle, as each contraction hit. They were strong, and felt like deep cramps. I pictured what my body was doing — the cervix opening up for the baby — and tried to let it do just that. This whole time Peter was timing the contractions using a phone app. At a consistent 40 seconds long and seven minutes apart, I knew there was no turning back and I needed to call my doctor. I told myself I’d call at 5 a.m. Then as 5 a.m. approached, I started feeling like I had to use the bathroom. 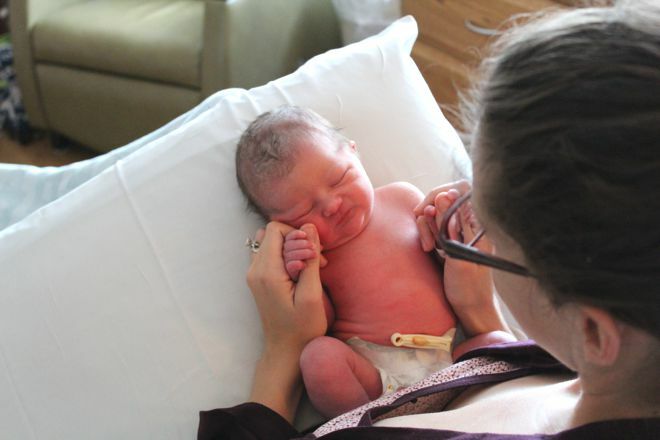 Between contractions and bathroom breaks, it was 5:15 a.m. when I finally made the call. The on-call doctor said it sounded like early labor and instructed me to come on in to the hospital. “Yay!” she groggily squealed to me. I was excited, but not quite “yay” excited. This wasn’t exactly the timing we had planned on. I left work Friday after telling a colleague I hoped I had a good couple weeks left to iron things out there before maternity leave. And I was a bit nervous about what was coming in the hospital. 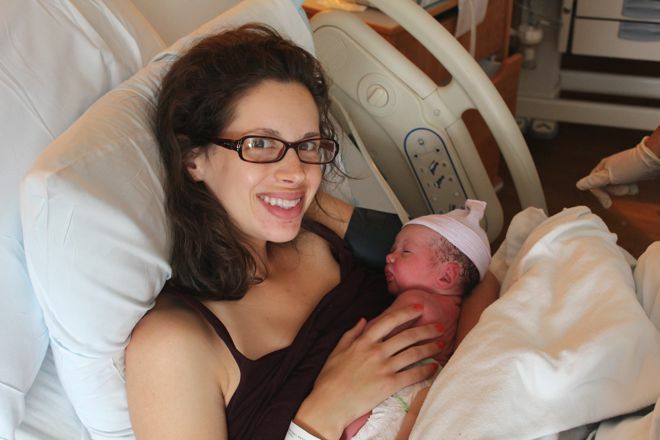 I wanted a medication-free birth, and now was the time to put everything I’d learned and hoped for into action. Peter admitted he was nervous — nervous that he wouldn’t be able to remember everything he’d read and be a supportive coach to me. We momentarily reversed roles and I assured him that he had nothing to worry about and had already been a great help. At this point, contractions were more intense, and getting out of bed seemed to further intensify and encourage them. My hospital bag was packed except for a few last-minute items, so I lay in bed while Peter gathered things together and woke his parents to tell them what was going on (yay for not having to worry about childcare for Corban). I tried to get up to brush my teeth, change into the nightgown I had planned on wearing in the hospital, wash my face, find my glasses, etc., but each time I got out of bed a contraction would take me down or I’d need to use the bathroom. I wished I could just lie there. I finally understood the appeal of a home birth — if the doctor came here I wouldn’t have to pack up and ride to the hospital. I had Peter take this as we headed out the door because he had refused to take a belly pic of me earlier that day and now this was our last chance. And I’m crazy. Finally, just before 6 a.m., we were in the car. Rick Jackson’s Country Countdown was on the radio — a show we listen to on Sunday mornings on the way to church. Peter sang along to Tennessee Ernie Ford’s “Sixteen Tons” (which always reminds me of this South Park scene in the episode from which our cat Biggles got his name) while I timed the increasingly close and long contractions. They were now more like four minutes apart, and seemed to ebb and flow in longer waves. A wave would wash over me, and just when I’d think it was peaking, another would crash in and prolong it. Peter slowed down at a stop sign and it felt like the longest deceleration in history as the seat belt pressed into my uterus. The hospital parking lot was hugged in a pre-dawn fog that gave our walk inside from the car a dream-like air. I wished for a wheelchair to carry me down the endless empty hallway from the entrance to our elevator, but powered onward rather than asking for one. We arrived at the administration desk on the labor and delivery floor around 6:20 a.m., and as I stood there to sign papers, a strong contraction doubled me over. Before I could put pen to paper, my water broke in an unmistakeable gush. “Clean up in aisle four,” Peter joked. There was no laughing for me though. I needed to get checked into our room so I could lie down. A nurse quickly led us to a room and helped me get cleaned up in the bathroom. I struggled to get the words out to decline the hospital gown she offered while trying unsuccessfully to relax through a contraction that felt different than the others. I was starting to feel the urge to push. I collapsed on the bed and attempted to resume the comfortable position I used at home. Hospital beds just can’t compare to your own king-size bed, though. Peter filled the nurse in on my desires — no IV, no meds, no interventions, etc. Apparently she had already been preparing whatever initial steps are necessary for an epidural, since (I was told later) about 95% of their patients ask for one. Suddenly her job got a lot easier. I asked to have my cervix checked, knowing that I had to be frightfully dilated if I was feeling “pushy,” as they say. I asked Peter to get me some water. Then I realized the lights were shining full force and asked to have them dimmed. Anything to bring a bit of comfort. A nurse continued to question us while setting things up around the room and I became annoyed as my requests went unfulfilled, another contraction left me speechless and everyone seemed to be (from my perspective) pointlessly flitting around. Finally I gathered the strength to insist someone check my cervix. The nurse did, and urgently told another nurse I had “nothing there,” aka 9 and 3/4 centimeters dilated and 100% effaced. “Is my doctor on her way?” I asked, only to learn she was just now being paged. At least they now understood how urgent the situation was becoming! Meanwhile, the resident on the floor, Dr. M (in fact, the same resident who was there for Corban’s birth), came in and we went over some more details with him. I asked if it was bad to hold back on pushing if I felt the urge. He assured me it was actually good to let the baby engage as much as possible before starting to push, but if I couldn’t resist any longer he was there to deliver the baby. I requested a crash course on how to push, and Dr. M obliged. I really wanted to wait until my doctor, Dr. L, arrived to start pushing, so each contraction I told myself I could wait one more. It was like having to hold it when you really, really have to pee. Not easy! When I finally decided this was it — I couldn’t wait any longer — Dr. L burst into the room (or at least that’s how it seemed to me) and I had a minute or two break in contractions to say hi. 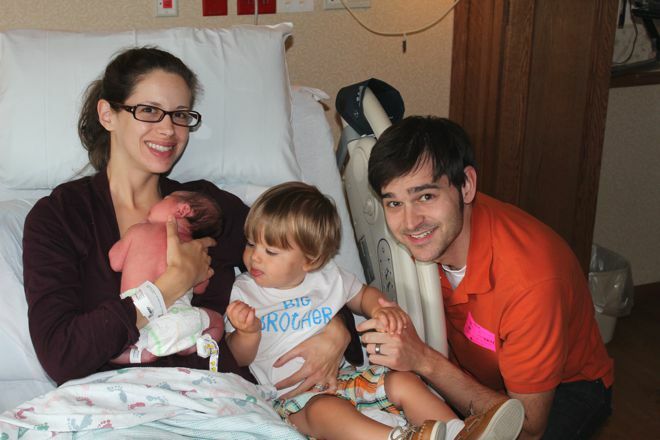 This is the part of the story that seemed the most drastically different from Corban’s birth. During the pushing stage with Corban, I felt like a machine struggling to keep up. When I was told his heart rate was dropping and I needed to push harder, do better and get him out immediately I was (obviously) terrified. My role was to follow directions — when to push, how to push, when to stop. 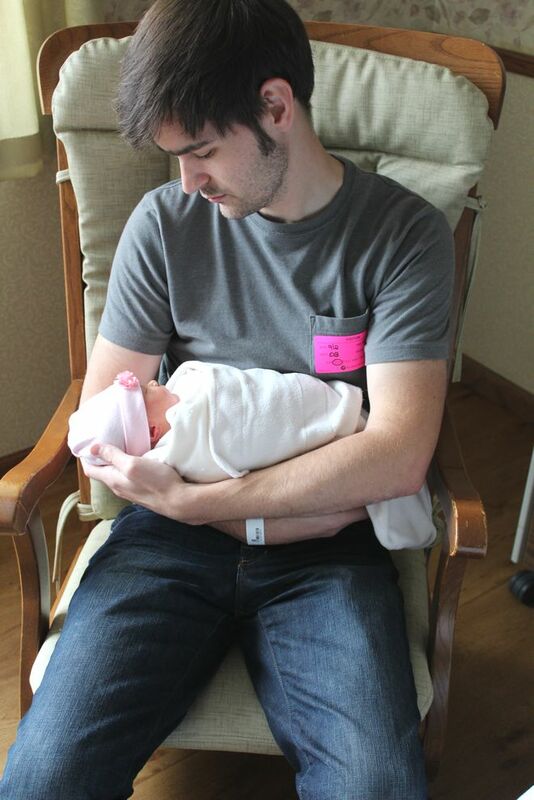 With Mara’s birth, I felt completely in control. I had no contraction monitor dictating to the nurse when to dictate to me to push. Everyone around me appeared relaxed and no one told me to start or stop pushing. I just pushed when I felt like I needed to and stopped when it didn’t feel right. Peter stood on my right and a nurse on my left, holding my legs, counting through each contraction, dabbing my forehead with a cool cloth and encouraging me. Outside the room’s large windows I could see that the fog had lifted and the sun was turning the sky pink, and I for a split second I felt almost calm. I focused all of my mind and strength on each push, relaxing my legs, holding my breath, bearing down in the right spot. Delivering a baby is most definitely an athletic endeavor! I knew the harder I worked with each contraction, the sooner it would be over. I had read that you get about eight-minute breaks between contractions during the pushing phase, but experienced no such thing. After each push/contraction I had to will myself to relax as quickly and completely as possible, because it would only be a minute or less before I’d feel the overwhelming urge to push again. Apparently even this part of my labor experience happens in hyper-speed. I can’t complain though. It was intense, with hardly a break, but after just 10 or 15 minutes, I was told this was it! Last push! Of course the last one seemed the longest. After eight months of wondering whether our baby is a boy or girl, with just seconds to go before finding out, time seemed to slow down. The anticipation of knowing was at the forefront of my mind even through the pain, exhaustion and relief of knowing the end was imminent. 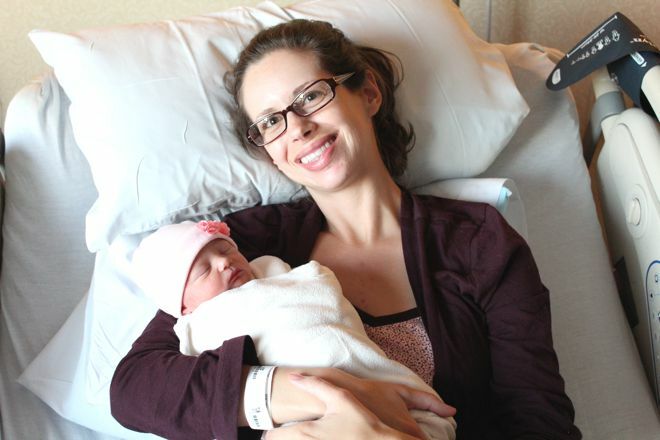 At 6:57 a.m., about 40 minutes after we arrived at the hospital, Mara entered the world and Dr. M held her up. “What is it, Dad?” he asked Peter. Before Peter could reply, I saw the answer and cried, “It’s a girl!” Over and over, through tears, I repeated that joyous phrase. Dr. L made sure Mara came straight into my arms. Her slimy, white, alien body lay on me as Peter and I admired our daughter. After a few minutes, the nurses took Mara to be cleaned up and weighed at a station next to my bed. My work wasn’t over, as the doctors delivered the placenta, gave me a shot of Pitocin to jump start my uterus contracting back to its normal size and began to stitch up my minor tear. Mara came back to my arms to nurse while they worked, and continued long after they finished. I could have held her like that for hours more. The fact that we have a daughter still felt so novel and unexpected. I couldn’t quite believe it. The concept seemed so foreign. 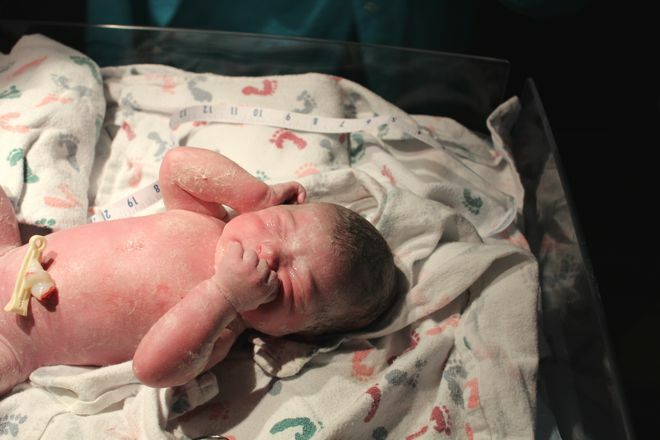 When compared to Corban’s first hours of life… talk about night and day (literally and figuratively). Corban was born at the end of the day and whisked off to the NICU, where I had to be pushed in a wheelchair to visit and nurse him every three hours throughout the night. Mara arrived at the dawn of a new day, which we spent in our room snuggling her close and admiring her perfect features in the bright natural light of a beautiful late summer day. Of course, there was nothing wrong with Corban, and after he was released from the NICU we enjoyed the same endless snuggles and bliss that a baby’s first day of life brings. But we are so grateful that Mara was healthy and her birth was completely natural and free of complications and interventions. I couldn’t have asked for a better birth experience and we count it as a huge blessing that it happened as it did. I know it may seem easy now for me to be an advocate of natural, medication- and intervention-free childbirth since my labor and delivery experiences have both been very fast, so I don’t feel like I’m in a place to preach. But I do want to encourage anyone who desires to go the natural route. It is so doable if you go in with knowledge, preparation and confidence. I am fully confident that even if my labor was twice as long and even more intense, the methods I learned from reading (no, skimming) one Bradley Method book along with the support of my wonderful husband would have still been all I needed to manage the pain. With my first pregnancy, I went into labor without enough knowledge of the birth process nor confidence in my own ability to effectively cope with the discomfort and unknowns of childbirth. This time I knew what to expect — and not even just from having experienced it once before. Truly, my reading during this pregnancy informed me on what I had experienced with Corban’s birth, and that’s when things started to click. I also owe a lot to my friend Litzy, who has been incredibly supportive and shared a lot of her knowledge to encourage me along this path. Here is the book that helped me: “Natural Childbirth the Bradley Way” by Susan McCutcheon. It’s not perfect and I don’t agree with every word in it, but it really was what equipped me the best for a natural birth. As with any baby, in the end it really doesn’t matter how she made her debut. As happy as I am with how her birth happened, the true joy is in Mara’s mere existence as my daughter. Congrats on your baby girl (born the day before my birthday :))! You’re right — it is such a great feeling doing it all natural. I am SO very happy for you guys!!! You have a beautiful family! birth with 2 midwives and a doula it was the most amazing experience of my life!!! Thank you 🙂 I can totally see why a home birth would be an incredible experience! 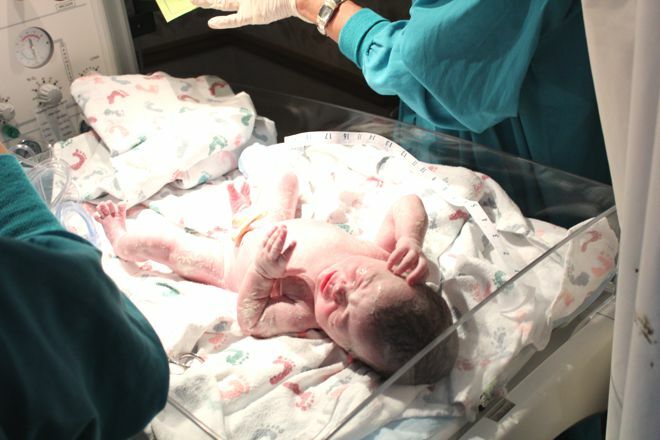 Somehow your birth story didn’t show up in my feed and I just saw it today!!! The truth is you didn’t need any help…just a little confidence and the empowerment that comes with knowledge!